Higher in Omego 3’s than conventionally raised grain-fed beef. We don’t use antibiotics, pesticides, hormones, or grain. Grassfed beef has rich flavor. We honor the land and the animals by raising them this way, thus facilitating an ideal environment in which we reap the benefits while also treating the animals and land with the care and respect we are called to give them. Our children helping us to check the cattle and fencing. We raise and finish our beef entirely on grass; a system that is largely based on the concept of rotational grazing. It mimics the grazing habits of the North American Buffalo herd, which at one time was largely untouched by humans and designed by the Creator. Rotational grazing has countless benefits and is accomplished using modern electric fencing. Raising animals this way builds soil organic matter and fertility, limits disease, odors, and parasites, and increases grass growth and quality to produce the most from the land. We believe this to be the best way of raising beef for many reasons. Cattle were created to eat primarily grass; however, grain finishing has been the adopted means of finishing cattle for decades in conventional agriculture. Cattle develop many health problems when confined and fed primarily grain and are often heavily medicated to keep them going. Most health problems can be avoided through rotational grazing and thus the need for medications. It is proven that healthy grass fed cattle make beef with a healthy blend of Omega-3’s, CLA’s, and Vitamin E compared to their grain fed counterpart. We raise our beef locally on pastures near to our customers. We use local butchers to process the meat, thus supporting the local economy. Most box stores only sell imported grassfed beef. Buying wholesale meat can have significant savings and benefits. The average price you pay your local farmer is often less than the average price of all the cuts of meat at the grocery store. https://www.ams.usda.gov/mnreports/lsmngfbeef.pdf Enjoy the convenience of having many cuts of beef on hand. Availability varies with the season, so please purchase enough to last through the winter and early spring. When buying a half or whole beef from a local farmer, you will receive a variety of cuts, and have the option to tell the butcher if you’d like more or less roasts, steaks, or hamburger. You can get optional liver and other things from the beef. Read below about our pastured pork! “Hi J&T, I just wanted to let you know how much we are enjoying our pork sampler! Good stuff!” -Rebecca W.
Our children helping daddy when it is time to give the pigs new pasture. The pigs are sniffing out their new pasture and woods. They love to explore and turn over the soil. 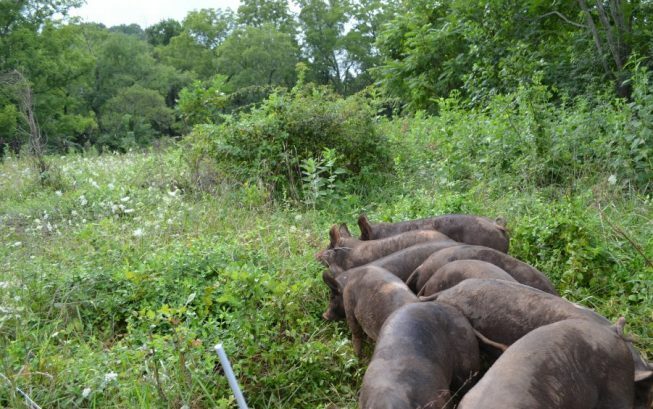 Our pigs are rotated on pasture with access to foraging areas, woods, and grass. Their natural diet is supplemented with non-GMO feed. Nitrite, nitrate, and preservative free pork. We raise our pigs on pasture with the freedom to move about and express their natural instincts. These happy pigs do not have the stress of confinement in jail-like cells, so they stay healthy and avoid the need for medications. Their rich diet from the pasture and non-GMO feed creates a deep rich flavor in the meat. Pigs will eat just about anything they find in the pasture so their diet consist of much more than just grass. Pigs are butchered locally and do not have any nitrates, nitrites, or any other questionable preservatives added to the meat. Fresh pork really is quite different from the over-preserved pork available in grocery stores. Click below to see our products and pricing, including our new delivery options!